A few days ago, The Telegraph posted an article to indicate that David Cameron, Nick Clegg and Ed Miliband had all joined the latest social network craze, Google+. The article was accompanied by the message, “the Google+ profiles are expected to be managed on a day-to-day basis by each leader’s respective social media teams, who also run all three politician’s Twitter and Facebook accounts“. This struck me as being rather odd. Why are the leaders of the main political parties in the UK so keen to announce their involvement with social networking, and then so quick to distance themselves from it? While all have posted at least one status update, David Cameron and Nick Clegg have so far not replied to a single comment. While Ed Miliband has so far replied to two comments saying “Thanks for the post. Wanted to reply to say welcome to the Labour Party. Ed“, and “Thanks for the comments on here. I’ll be posting to keep in touch and hear what you have to say. Ed“, the comments themselves, which are neither engaging nor vaguely topical, are hardly a sign of the bigger parties taking advantage of what David Cameron is calling the “new methods of engaging people online” in his own status update. Surely right now, when the media is focused on their involvement with Google+, this would be the best time to set aside time to get involved, even if it was only done for the potential of political gain. It’s curious why the party leaders seem barricaded from operating their own social networking infrastructure when many politicians capably operate their own Facebook pages and Twitter feeds. Of the currently elected MPs, 289 are on Twitter. Among the more frequent users, Jamie Reid MP has reached over 4,400 tweets. My own local MSP Linda Fabiani operates her own Facebook page in a personal and political capacity, and frequently engages in debates and answers questions on both subjects. 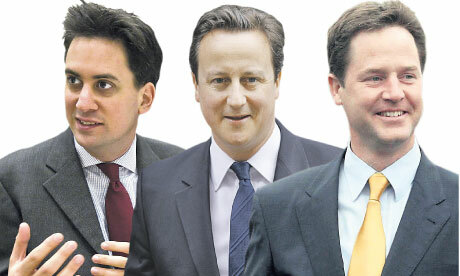 If the party leaders are simply too busy to maintain their own social networking sites, then they shouldn’t have them. We aren’t fooled by the pseudo-personal updates, it is apparent that there isn’t an opportunity for any back and forth with real people that would like their questions answered through these channels. Instead of adding their social networking accounts to your circles, friends or by becoming a follower, try these more traditional channels. The link provided for David Cameron indicates that mail to his postal address will be replied to.